Photo courtesy of the Abraham Lincoln Presidential Library and Museum. The Museum is open daily, and you could easily spend an entire day viewing the exhibits, reading the materials, and soaking in all the history. The wealth of information and materials is dizzying, including more than 13,000 books and pamphlets covering every aspect of Lincoln’s life. Permanent exhibits include Lincoln’s Pre-Presidential years, the Presidential years, and The Treasures Gallery. 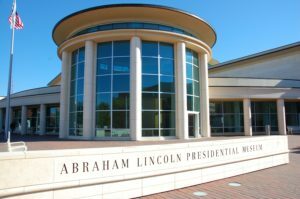 The Treasures Gallery is a highlight of the Museum, where visitors can view a rotating exhibit of more than 280 historical artifacts associated with President Lincoln and his family. Many of the items were part of the collection of Louise Taper that the Library acquired from 2004 to 2007. Among these is Lincoln’s iconic stovepipe hat. In addition to the permanent displays, the Museum hosts temporary exhibits, such as the current one, Lincoln: History to Hollywood, featuring sets, props and costumes from the DreamWorks film Lincoln. Those interested in Illinois history will be delighted to know that the and Museum’s expensive materials relating to the State, such as a special Oral History Program preserving the stories of citizens, both ordinary and famous. Located less than 30 minutes from the Museum, Market Street Inn exudes a warm hospitality with a welcoming wrap-around porch. Inside you’ll find ornate woodwork, pocket doors, six original fireplaces, and a grand staircase leading to eight guest rooms (two more are in the Carriage House) with modern amenities. All this and delicious breakfast too! Market Street Inn is a member of the Illinois Bed and Breakfast Association and offer a unique lodging experience! This entry was posted in History, Illinois Bed and Breakfasts, Museums and tagged History, Illinois Bed & Breakfasts, Museums by admin. Bookmark the permalink.